They call her Cabiria...No Matter How Many Men She Was With - She Would Always Be Alone! 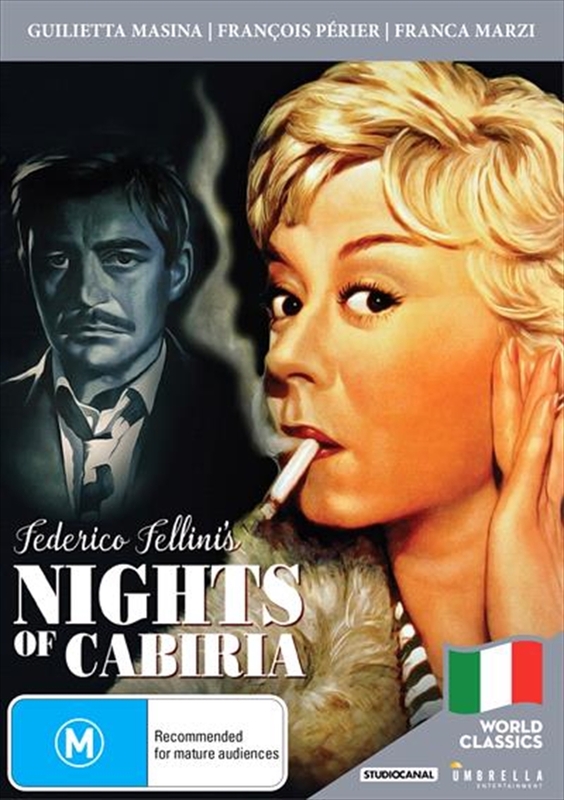 Cabiria (Fellini's wife, Giulietta Masina) is an eternally optimistic streetwalker with a heart of gold, who wanders the streets of Rome looking for love but finding only heartbreak in Fellini's Oscar-winning masterpiece. On a despairing day she goes into church to pray, hoping for a miracle to change her life. Shortly afterwards she meets an earnest young man willing to marry her. At the height of her happiness, she believes she is saved and has broken away from her past, taking her savings to follow him but he vanishes with her money...This funny, poignant classic inspired the musical "Sweet Charity" and is a must-see for Fellini fans.